With Tech N9ne’s Independent Powerhouse Tour 2013 ready to kick off in March, Strange Music has once again given fans a chance to live the experience VIP style complete with over $350 in merchandise and this year, Strange Music offers up one of the most sought-after collectibles yet. 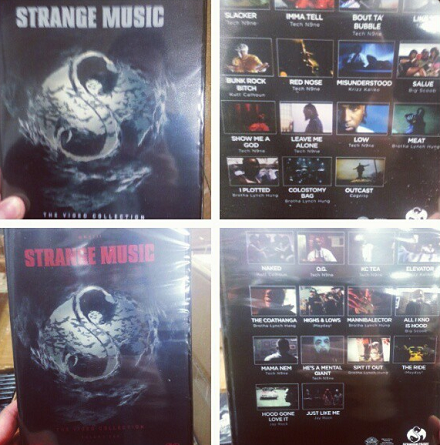 Strange Music: The Videos Volume 1 & 2 are the first two collections in a brand new DVD series that will chronicle the complete music video history of Strange Music. From Tech N9ne’s “Slacker” to Brotha Lynch Hung’s Coathanga Strangla mini-film series, it’s all here in its original form for the very first time. The only way to get your hands on these DVDs is to purchase a VIP package – don’t miss out on this incredible collection and start it off right with Volume 1 & 2! Check out the DVD Table Of Contents below! CLICK HERE TO GET YOUR VIP PACKAGE! What would you like to see on future volumes?